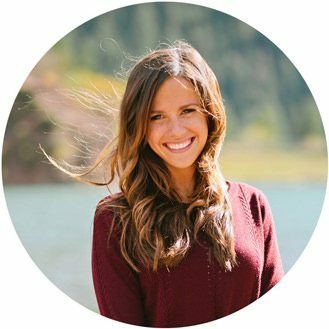 Brooke will be holding a running form clinic (I am her first customer) next week for anyone that wants to come. 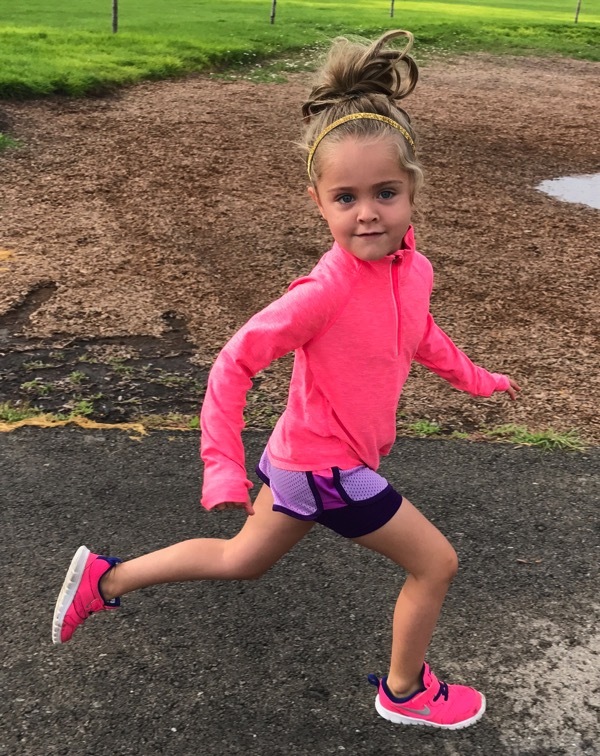 I love watching her FLY when she runs… I think she might have a future with running (I just need to get her a pair of Brooks). I also really loved this picture… just looking calm and in control mid-stride. No big deal. Monday morning was something special over here… 60 degrees when I left the house. It rained last night and the clouds were still covering the sun so it just felt perfect outside. I went for 8 miles instead of my normal 7 just because it felt so much better outside. And then this happened. Andrew had this for me when I finished my run. Food always tastes a million times better when someone else makes it for you! 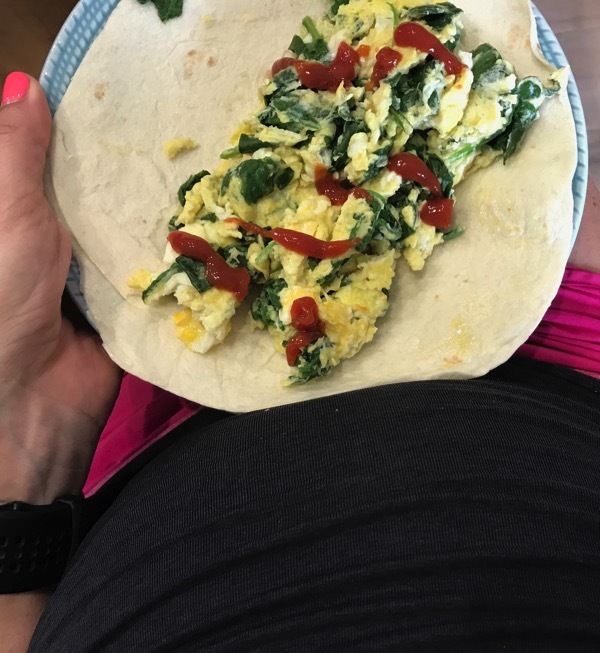 I feel bad for saying such bad things about eggs during the first 15 weeks of pregnancy and swearing I would never eat them again because I love eating them again. Ketchup is a must on my eggs. After I ate we hit up a park and had to wear jackets… that was a strange feeling! We played there until the sun decided to come out and then I was too hot in a matter of seconds. Brooke agreed with me that going home for a smoothie was the best idea possible. Two breakfasts a day is a very normal thing around here. 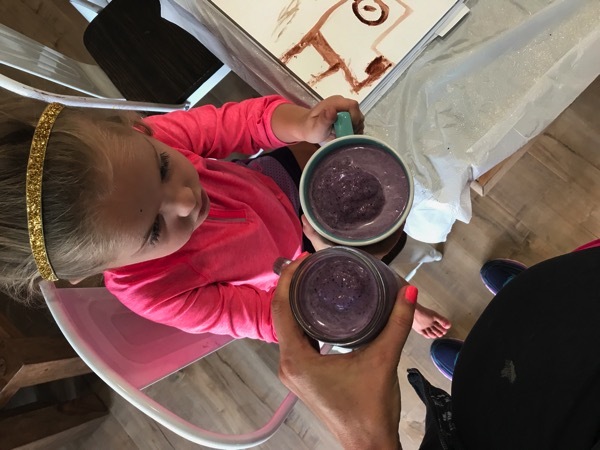 Frozen blueberries + frozen bananas + peanut butter + milk + Aloha. And a peanut butter stain on my stomach when I was eating it straight out of the jar. 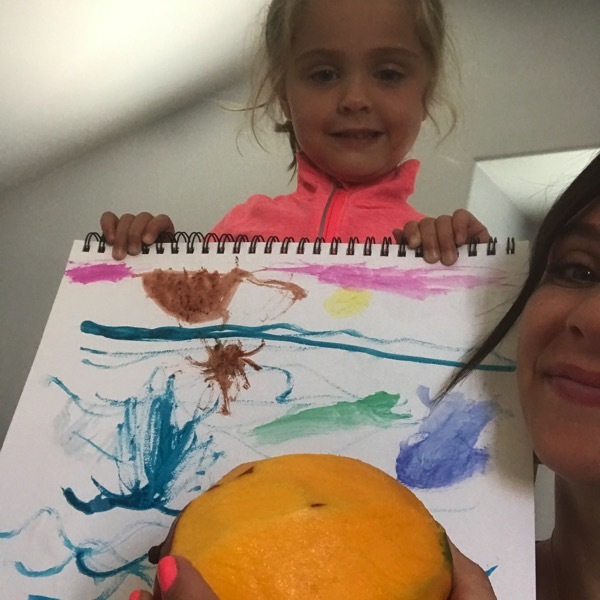 Lunch included grilled cheese sandwiches, mangoes and some painting. 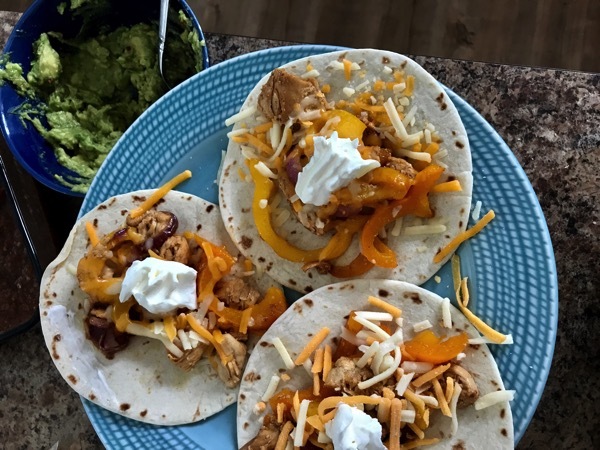 For dinner we made everyone chicken fajitas and they were a hit! The guacamole was too! and Beretta made herself right at home with my niece. *I just found out that Oprah has a podcast now. Day made. My mom and I used to watch Oprah together (and my sister too when she lived there for a little while when I was in high school) almost every day after school each day. I LOVE LOVE LOVE Oprah and can’t wait to start listening. *We all have pictures that we don’t particularly love when we see them right? Race day pictures especially… somehow at times the camera manages to capture our leg muscles going in 30 different directions:) This weekend I came across this picture of me with Brooke at her race and I instantly saw my cottage cheese. I’ve always had cottage cheese on my legs, even at my thinnest weight years ago when I was disordered… it’s just part of me. When I first saw the photo it wasn’t my favorite but whenever that happens, I remind myself that I’m a paintbrush… my body is my tool to create beautiful things and in this picture below not only am I creating a new baby girl (I think I was like 9 weeks along or something) but a memory with Brooke at a race. Who cares if the paintbrush isn’t perfect? It’s creating my definition of perfect…. *I was going through my coaching handbook from the RCCA and came across this! I’ve known a lot of people that try out the ‘train low’ and I’ve always been interested in if that helps them come race day! (Sports Nutrition, Nancy Clark MS, RD, CSSD). “Should I train with poorly fueled muscles, as a means to teach my body to burn more fat, so it spares the limited glycogen stores? 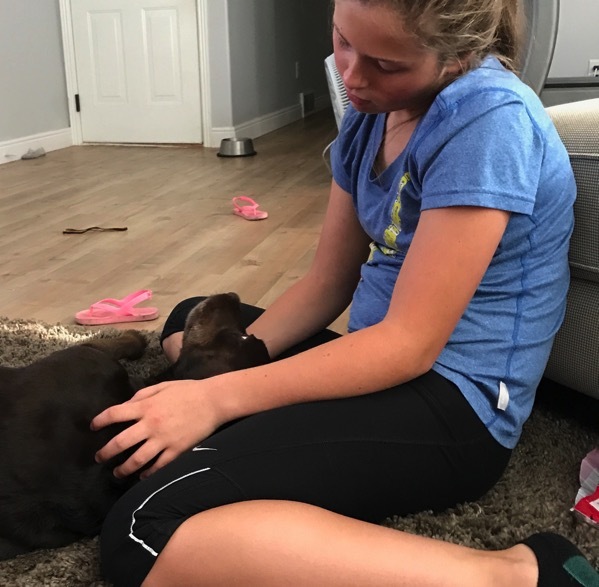 *This article helped me feel a little bit better about the big event ahead of us… you might want to check it out if this is something coming up for you too… I cried (of course). Your comments yesterday were amazing (I LOVED all of your ‘best advice’ answers especially)! 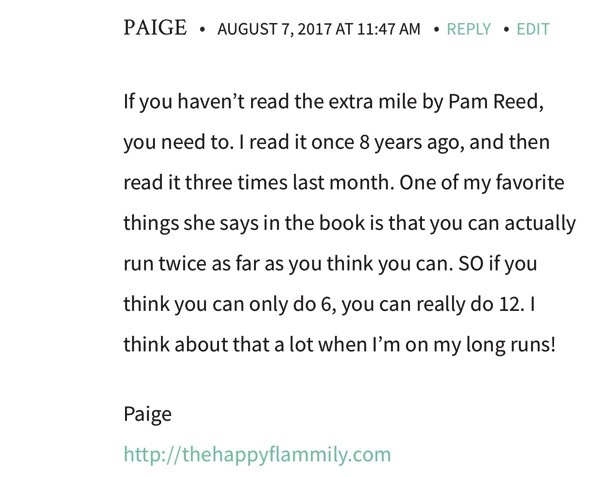 What Paige said really stuck out to me… I think our thoughts are what hold us back the most in our running. I’m been wrong about a lot of things and I think my potential as a runner is one of them! Anyone else read the Extra Mile… I think I need to! What would you say are some of the best running books out there? What do you do when you see something on your body you want to change or a picture of yourself that isn’t your favorite? Anyone else watch Oprah religiously when her show used to be on? Her Favorite Things episodes were always our favorite. What are you having for dinner tonight? I had a plan for something tonight but it doesn’t sound good anymore (story of my life right now)… so I need ideas of something different! Those running pictures of Brooke are so great! She definitely has much better form than I do! I love that paintbrush analogy. I think we are often hardest on our bodies and our appearances, and it’s definitely a lot easier to do nowadays with Instagram and whatnot. I’m going to need to remind myself of the paintbrush analogy more often. Thank you for sharing that! The pictures of Brooke running are awesome! This isn’t that original but tonight I’m having burgers for dinner and last night was tortellini with pesto. This isn’t a running specific book but I highly recommend “Eat Sleep Move” by Tom Rath. I read it in one day it was that good. The premise is that eating, sleeping, and moving are all related and interact with each other. When I see something in a picture that I don’t love, I think about how my body has done so much for me just the way it is! It’s moved my in and out of countless places (thanks college), ran hundreds of miles, and it led me to my boyfriend. So while I want to tone up a bit, I don’t beat myself up about it. I watched Oprah fairly religiously. I’ll have to check k out her podcast. I try and think of my body for what it can do rather than how it looks. But it’s hard. I’m almost 44 and still critiquing it in photos like I am 17. Sigh. Yes yes yes! Thank you Janae!! I get down on myself all the time about all of my “imperfections” – especially the cellulite on my legs…why do I feel like there’s more and more as I get older? Janae! 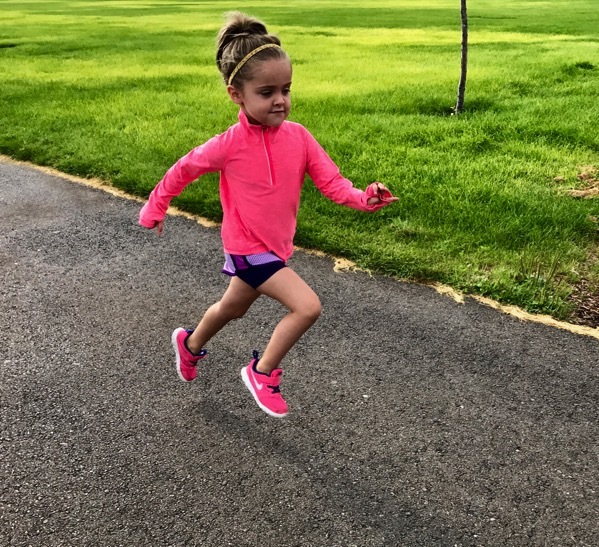 Oh my goodness, Brooke’s stride and running photos are killing me – so, so precious! 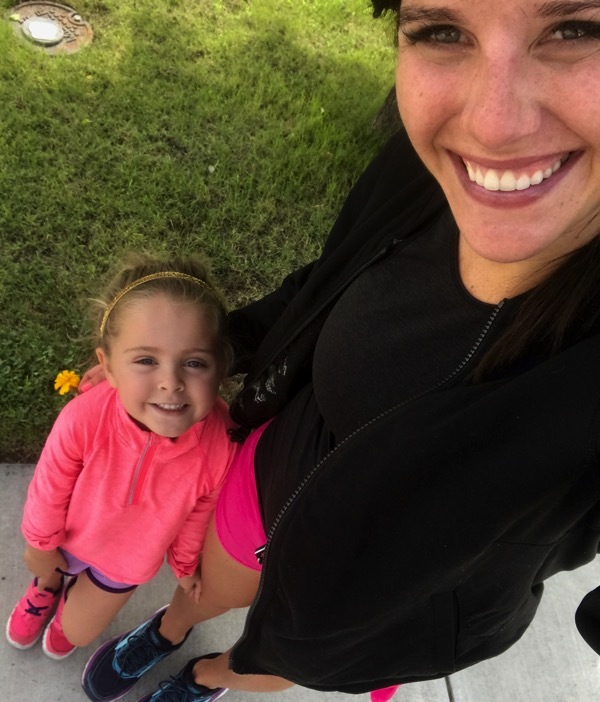 I love that running is such a sport/lifestyle we can pass down to our children. My mom ran and I can’t wait to share my love for running with Benaiah and future kiddos. I’m still pretty bad about critiquing my body when it doesn’t look the way I want (“Why has nothing changed even though I’ve been running religiously for nine weeks? !”), so that is something I am working on. The paintbrush analogy is great. You are so much more than your body, you’re also what your body can do. I mentioned yesterday the best piece of advice I’ve gotten is that “Strength doesn’t look a certain way, it feels a certain way” (Kelly at Run, Selfie, Repeat says this all the time), so I have to remember — maybe my legs don’t look all that different or more toned than they did nine weeks ago, but I sure wasn’t running 10 miles nine weeks ago either. I am stronger, and that’s what counts. Joanne, you are 100% right… YOU ARE SO MUCH MORE THAN YOUR BODY!! I love that quote, it is perfect! Keep up the amazing running because it is taking you amazing places and making you strong. I hope you have a beautiful day! 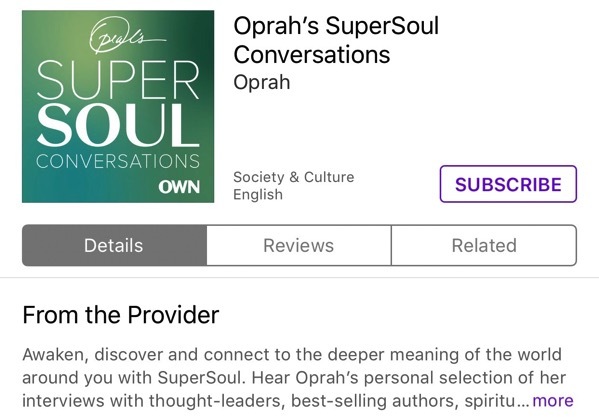 I loved watching Oprah….going to get the podcast right now!!! I love the body positivity! I try really hard to not be too critical of myself, but it’s hard to not fall into the habit of critiquing rather than appreciating. However, if something is really bothering me, I typically know what I need to do…eat better. I have no issue with motivation to work out, but I also love to eat, so that gets me sometimes! It’s all about balance though. I have been on a huge sandwich kick lately, so tonight’s dinner is going to be a grilled cheese sandwich with some buffalo chicken added in, and either a salad or some veggies…maybe both! Oprah was my absolutely favorite!!! I still love her and I’m so sorry I never got to be in audience of one of her shows. I did go to see Harpo studios though years ago when I was in Chicago. I watch her every day growing up, up until her last show back in I think it was 2005. It’s funny because a fraction of a second can make a big difference of what a photo shows. The good, bad and natural. I think it’s important to not limit posting the perfect photo all of the time. As ladies we all have dimples, weird crinkles and wrinkles but it’s just part of being a human. I absolutely love the idea that your body is your paintbrush – that is so powerful. I very easily fall into the trap of seeing a picture I don’t love, then scrolling through old pictures and thinking “wow I looked so great then, what was I eating/how much was I running! ?” But what I’ve realized is that 2 months down the road, I look back on that same picture I might not have loved and I end up having the same the same thought of “wow I look great there… etc”. Learning to appreciate what we have in the moment is so important, thanks for the reminder – celebrating what our bodies do for us is so much better. Oh I TOTALLY do that too Katie, and it doesn’t make sense! Let’s keep working on this together girl! I hope you have a great Tuesday! I’ve always believed that you can double what you’re able to run now. Right after high school I ran a relay marathon with my mom and my cousin. My cousin and I were supposed to run 10 miles each but we missed our hand off somehow and I ended up running the full 20. Previously I had only run 9 miles at a time. I’ve always said if you can run 3 miles, you can do 6. Thank you for the paintbrush analogy. It reminds us not to miss out on life worrying about things that really don’t matter. YES YES YES exactly Maggie! Thank you! Yes, my mom and I would always watch Oprah too! Thanks for posting about the paintbrush theory. Any positive ideas women can share on body image are always great. We all need to be more kind to ourselves! I’m so glad that your health issue was a minor one and I hope you are doing well now Sarah! I love the thought process you have learned and the gratitude… gratitude makes us so much happier than picking apart at ourselves. I hope you are having a beautiful day! I love this post and the paintbrush theory! Thank you for sharing that! I was in a really bad place with my eating disorder years ago and have made tremendous progress ever since moving to Chicago. When I first started gaining muscles in my legs (while also getting a ton faster), I freaked out because my legs “looked bulky.” But then I just kept reminding myself that my former chicken legs would have never run as fast as my legs can today … AND I’m injured so much less. 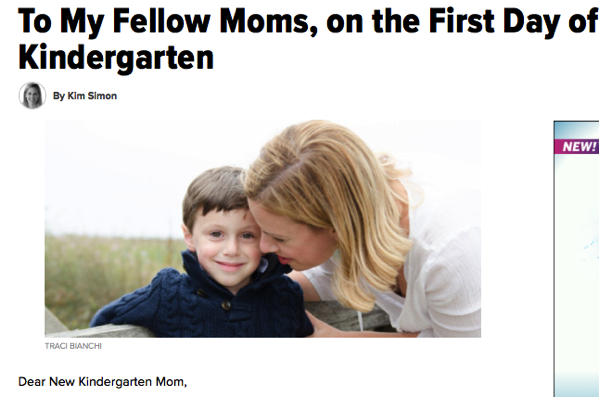 The article on the first day of kindergarten resonated with me, only my boy will be going to college soon and this mama is struggling with it big time! His first day of kindergarten feels like it was just yesterday and I definitely wonder “how did I get here”!! The paintbrush analogy is a great reminder too! Thanks for that. 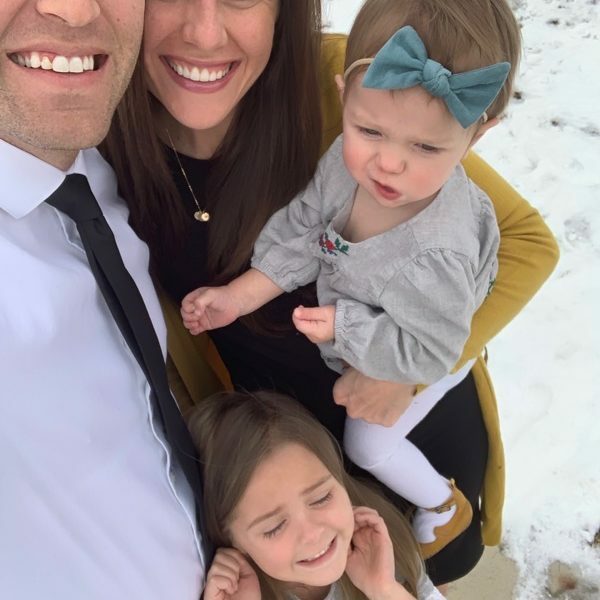 Have a great day with your cute family!! Karen, AHHHH what a big change. I am so so sorry you are struggling with this and I hope you feel peace, comfort and happiness over the next few months! Keep me updated with how you are doing!! Yep, I pretty much always cringe when I see my legs in race pictures. But then I think, seriously? Those legs are taking you through a marathon/half-marathon/5K/whatever distance – you should be proud of what they can do, not focus on what they look like! I think running has really helped shift focus from what my body looks like to what it is capable of. And I’ve also just accepted that my body is not going to be perfect no matter what, so why dwell on the things you can’t change? Thanks for the reminder today! Thank goodness for running and I LOVE the shift it has created for you in loving what your body is capable of doing! Thank you for sharing that Mollie, you are amazing! Race photos are the worst! I like small races that don’t have them lol. Brooke looks like a future track star! WAIT WHAT!?!?! You are allergic now… NOOOOOO! My dad has been allergic to eggs his entire life and it is so hard! Plus avocados, I hope these two things change back again someday in the future Sara! Loved this post. I love that you shared that picture of you running with Brooke, I’ve struggled throughout the years to love the body I have, imperfections and all. And honestly, I finally do. I accept all of it. It’s a strong body, with strong legs that have carried me many miles & races. I am going to do my darndest to teach my girls how to love their bodies sooner that what I did. I wish I had someone telling me during those oh so awkward Jr High years that it’s ok & it only gets better. I also loved the quote about being able to run twice as far as you think you can. I can do 13.1, so I can do 26.2!! Brooke looks so strong and composed! Gotta get her signed with Brooks asap! And I definetly need to read that book! I’ve been struggling on my long runs big times. Hope you have a wonderful day today Janae! I LOVE the paintbrush analogy and I love the cottage cheese picture! You have no idea how much that helped me to know that everyone has it! Sometimes I tell myself it’s just loose skin because my muscles are smaller than they used to be. I try to focus on the things my body can do, and not how it looks but sometimes it’s hard. Schemes dressing rooms are the worst for some reason! Must be the lighting. But there’s too much life to be lived/adventures to be had to be held back by what I think about my body. We’re having turkey chili tonight for dinner. Ughhh sometimes I look at my belly that is still too jiggly a year later (tbh, that was a trouble area for me before I had a baby) and I just remind myself of the precious girl who lived and grew inside of that belly! Like Janelle said below Babies > Abs!!! Keep reminding yourself that because that is what I do too!!! If there is a photo of me that I don’t like I try and remember what I was DOING…not how I looked. I was running a PR, or a hard workout! Even a non running one I’ll focus on how I felt, or what I was doing instead of how I looked. I was laughing and having a good time! When I was pregnant I focused on the fact that I was growing a baby. How a photo looks doesn’t change the good memories, the PR’s, the way things happened. Oh Laura, that is a great way to look at photos and I’ll be copying you on that… focus on what we are DOING! I love it! Thank you for sharing Laura! My absolute favorite running book is “What I Talk About When I Talk About Running” by Haruki Murakami. It’s really great on audio book. I always enjoyed Oprah’s favorite things show. I looked forward to that all year!! My dinner tonight is Greek Salad with grilled chicken. (romaine, greens, feta, red onion, cucumber) I’ll be looking forward to it all day!! I want to bake SuperHero muffins too (Run Fast, Eat Slow) if I have time…more veggies!! I think she does the favorite thing in her magazine now. I have to remember that paintbrush analogy! Race photos are always so hit and miss. Sometimes they make you look so cool, other times really unflattering. The cool ones, I save, and the unflattering ones I just ignore because I know I don’t really look like that to the human eye, but just captured at a moment when my body was doing something weird. My favorite running books are “Born to Run” by Christopher McDougall – a really exciting, page-turner story + incredibly informative running research on running form – and “What I Talk About When I Talk About Running” by Haruki Murakami – the first running book I read when I started running. It’s so calm and meditative but very inspiring. Right now I’m training for my first marathon so I’ve started reading “Hansons Marathon Method” and loving it so much. I am learning a lot about my body and its physiology! Yes yes yes… remember the analogy Cat! I agree, sometimes those photos are not what is seen by the human eye either! Born to Run is SO good and I need to read the other one your recommended… thank you! I LOVE Hansons Marathon Method, so so good! Thanks for your comment today Cat! 1. Brooke’s running form is the best I have ever seen. ‘Babies > abs’ I LOVE that so so much.. thank you for your comment! I hope you have an amazing day Janelle! 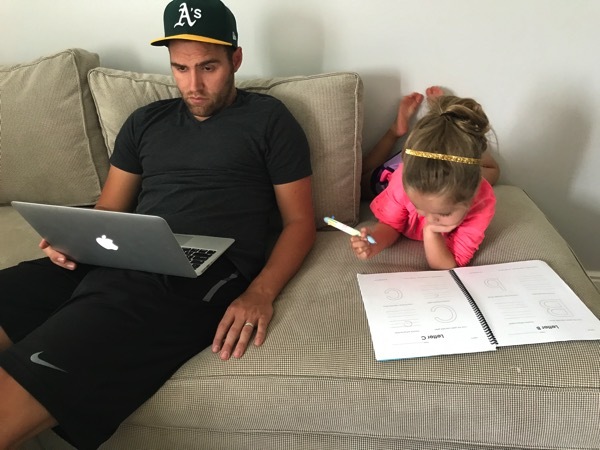 I need Brooke to help with with form, I cannot get the lean down. She looks so joyful running. I used to watch Oprah with my mother when I got home from work. After I was married my mother-in-law would always tape her holiday giveaway so I could watch that with her. (my mom lived in another state by then). I still have to figure dinner out but I think we’re grilling chicken. I used your tip on driving my knees last week and I shaved off almost 30 seconds per mile! (and it was crazy hot and I was taking some walk breaks so I was especially pleased). I LOVE that the knee tip helped your run out and way to go on doing that run in the heat too! “I remain who I am inside no matter what the package looks like”… I loved that so much! 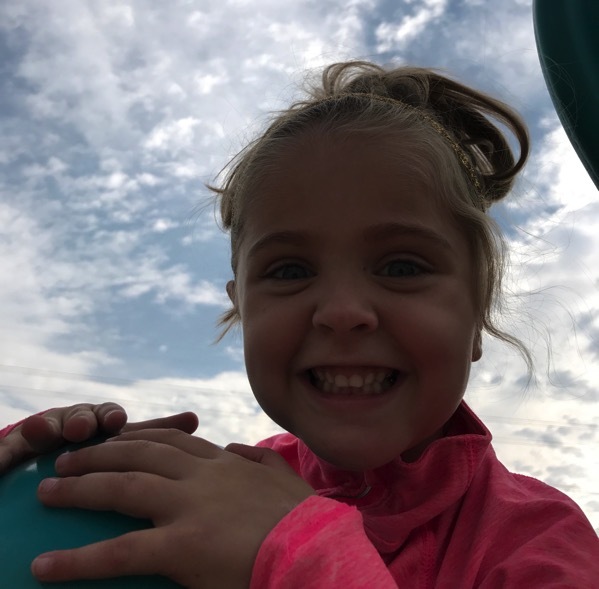 Thank you so much Nina for sharing and I hope you have a wonderful day! Learning to love our bodies is not easy. I appreciate when you share such personal feelings about yourself. I have always hated my calf muscles. They are so big and I can’t wear boots up to my knees in the winter (they won’t zip up all of the way). These massive calf muscles have helped me travel many many miles, running, biking, and hiking. I never want my daughter to be so critical of her body. I want her to be happy that she has a body and remember the true reason we get one. I completely agree… this is something I’ve worked on for 10ish years and I still have so much more to learn. Thank you for sharing your thoughts and being vulnerable Megan, it means a lot and those calf muscles of yours take you amazing places! Such a great perspective. I agree, sometimes I think something and then think do I ever want Brooke to think like that… NO! So I shouldn’t either! The Lord blessed me with thighs. I don’t always love them but I try to remember they make me STRONG. So, they aren’t little, but they carry me through a lot. It also has the effect of making sure I tone them, if I think about them being strong, I want them to be stronger. Does that make sense? Kate, thank you for sharing and that totally makes sense. A lot of sense to me. Focusing on what our bodies can do will always make us happier than focusing on what they look like. I LOVE that you told that lady what you were thinking in the restroom… thanks for being a good example to me to do that more often. I hope you have a wonderful day! I was in an awesome spot last spring, was finally at a point where I liked how I looked. I am thin, according to everyone else but you know how that goes when it comes to your own opinion!! Then in the early Fall I had some personal things happen, one major unexpected event and I lost about 20 lbs in 6 weeks. I stayed at this crazy low weight all winter and then suddenly the stress wasn’t there and I was snacking on things. I gained the weight back and I now just feel huge even though I am still thin. I am slowly trying to figure things out. If I think certain clothes don’t fit I am not even trying them on. I might not like how I look right now but I keep telling myself that eventually I will and that my healthy body lets me do a lot more. 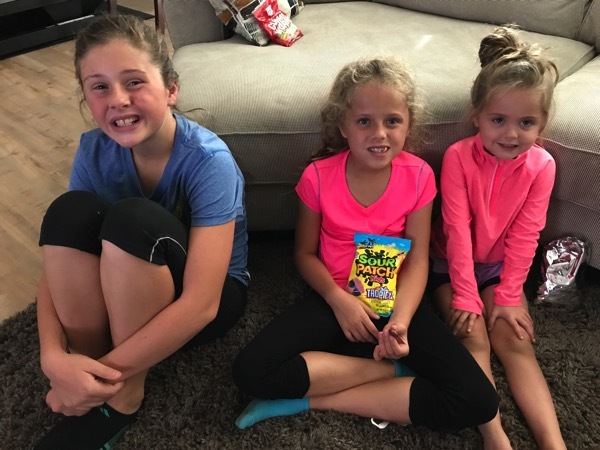 I have two girls and I have made sure to never make negative comments about my body outloud. My 9 year old said to me one day ” I don’t get how some of my friends hate how they look, who cares, I don’t care what people think, I am strong and smart so who cares?” Guess I have for something right! Thank you for sharing this all with me Carrie! I dot that same thing with clothes I know won’t fit or that are crazy tight… they are put into storage and maybe they’ll fit again and maybe they won’t! 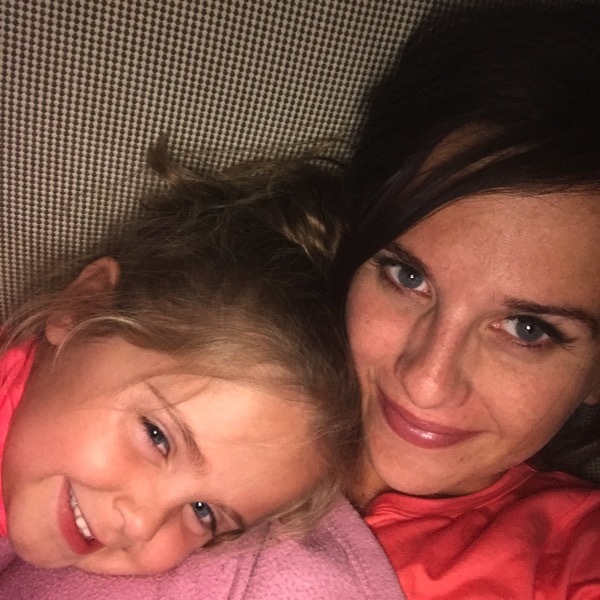 You are an amazing mom to those two girls and I LOVE what your 9 year old said. Absolutely perfect. CONGRATS KAYLIE on your pregnancy! That body of yours is sure doing amazing things right now! Keep me updated with how you are doing! I use to hate my calves – they are massive (really!) Then about 5 years ago I was visiting my dad in the hospital, he was 72 at the time and when he sat on the edge of the bed I realized exactly who I got my calves from! We can’t change genetics. We’ll probably have something light for dinner – Les has an evening bike ride. But we are definitely having peach cobbler (http://mcmomentsandmemories.blogspot.com/2010/08/friday-foodie.html) and homemade ice cream. I made the ice cream yesterday then our power went out before it was completely hardened and I couldn’t bake my cobbler. Talk about delayed gratification!! THAT COBBLER LOOKS HEAVENLY… plus homemade ice cream, amazing! Enjoy every bite! Oh that book by Meb is SO good! I need to read ‘Running for My Life.’ I love the story you shared about where you got your calves… they have taken you amazing places. Thanks Kathy for sharing! I hope you are having an amazing day! I try to stay calm about my body’s appearance; I’ve spent wayyyyy too many years beating myself up about not being the absolute thinnist person. I find it helpful to shut down the negative thought process and remind myself that my thoughts are not facts- especially the negative ones! I went through an oprah phase back in the day… her book picks really are amazing! I’m doing a salad with grilled chicken, walnuts, cranberries, and raspberry vinaigrette for dinner tonight! OH I LOVE THAT KERRI… thoughts are NOT facts! Love it:) Thank you for sharing that with me and your dinner tonight sounds heavenly!! Enjoy! AHHH you’re a frickin BABE! Andrew loves it when I’m pregnant because of how my body gets softer and wavier. ;) It’s more sensual, more exciting, more safe. I mean, I know we’re not supposed to change our bodies to meet our partner’s needs or anything–I am NOT suggesting that—nooo no no no—I’m only saying that there is beauty everywhere and it is ALL about perspective. Because hey–when I was super skinny (I had a husband and a son both in the psych ward at the same time at two different hospitals while looking after all kids by myself, so I didn’t eat, like NO KIDDING)–my body was hard, and muscular, and yeah I mean, I bet a lot of people thought it looked beautiful. And you know what? IT WAS BEAUTIFUL. Because I was surviving, and loving, and my body served me and my family. It did what it could. And then years ago when I was pregnant with Freddy, I gained a zillion pounds and I was beautiful then, too. Because I was surviving, and loving, and my body was serving me and my family. You KNOW I won’t stop typing. <3 Love you. Suzy, I loved every word that you wrote. Each season provides us different struggles, strengths and experiences and our body may be changing because of those but it is BEAUTIFUL with each of those stages of life. Thank you for sharing, I just think you are the greatest! Hahaha and my Andrew is totally like your Andrew with pregnancy! I hope you are having a beautiful day! Thank you for this post and sharing insecurities you’ve dealt with! The idea of our bodies being paintbrushes is really cool. I find that when I’m feeling unhappy with something about my body it really is so helpful to think of all the things that my body can DO. Also, I think about the people I most admire and want to be like–and the way I feel about them has nothing to do with their appearance! Tonight we’re having steak sandwiches with sauteed onions and peppers! Thank you for your comment Amanda, I really appreciate it!I love that you think about the people you admire and I’m just like you, it has NOTHING to do with their looks/size and everything to do with how they make others around them feel! 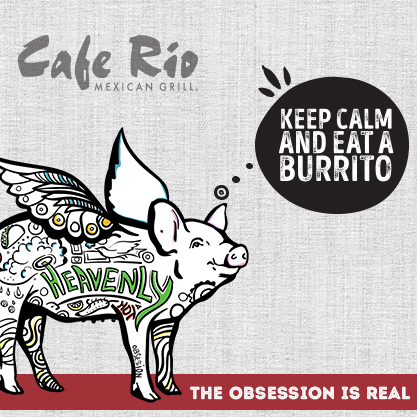 Okay, your dinner sounds heavenly… I might have to copy! Thanks Amanda! Oooh, race photos are scary to me sometimes! Of course I think everyone else’s look great! Photos are just a split second of time so I just move on and TRY not to think about it. Of course you ask about dinner on the night we are making the dopey-ist dinner EVER! mac and cheese pizza. I make Annie’s organic shells then put them on a fresh pizza crust (with a light smear of sauce) then turn the edges over to make it more of a thick edge, then brush with olive oil and sprinkle trader joes garlic and salt on it. My kids think it’s the best of two worlds. Brooke is a natural runner! Downloading the Oprah podcast NOW. And thank you for the paintbrush theory – I had never heard of it before and it is now my new favourite article. You are AWESOME for posting that picture. For sure, you just changed how many girls and women feel about their own imperfections, especially given the audience you reach. Bless you for that. I was doing downward facing dog the other day in hot yoga and was temporarily horrified by the same thing on my legs, but then I was like, “you know what these legs are capable of??? Hot yoga, 50K’s, hiking the grand canyon, etc, etc, etc.” It is an intentional mind shift. Thanks for sharing. Thank you for being real and open. It truly helps to see that you struggle sometimes too. You are so sweet and beautiful. I love love love reading your blog. I think it helps me to remember that we all have something (or things) we don’t like about ourselves. It helps to remember I’m not alone. I have a child with physical disabilities, so I often remind myself that bodies are miraculous and I’ve learned to be grateful for what mine can do, regardless if I like how it looks while I’m doing it. Perspective, I guess. Brooke’s form is impeccable. If only it came so naturally for all of us! I try to read one running book a month (along with my other book reading). Some months it actually happens. Here are some of my favorites. If you want more detailed reasons why I like them, you could read the reviews on my website. Each of these books is very different, but each of them made me want to get out and run, and to me, that is what makes a good running book. The writing doesn’t have to be amazing. The insights don’t have to be new or exciting, but while I am reading it should make me want to go run. Janae, thank you SO much for this post!! I had the same cottage cheese thing going on in my last race photos and at first I cringed, but then I thought, these legs just got me a PR, bring on the cottage cheese, maybe it has some secret power! And i LOVE the paintbrush analogy, that’s just perfect. And look at that form, Brooke! We are all our own worst critic. I look at that photo and see an amazing bicep that represents strength, hard work, and commitment. Right now I’m beyond OBSESSED with the book Peak Performance by Brad Stulberg and Steve Magness. 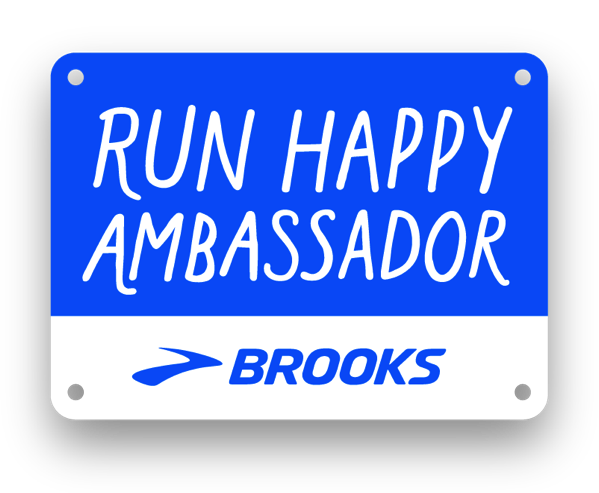 It is super helpful and interesting for running and just for life in general. I highly highly recommend it! If I see a picture of myself that I don’t like or that isn’t as flattering as I would like I will still immediately delete it. It is more like a reflex at this point. Or I’ll some how crop or edit it to make it a little better. I honestly don’t even take a moment to think about it, I just do it and I completely didn’t realize it until just now reading what you said. Thank you for talking about this and sharing this picture, it hit right in the feels for me. That is an incredible quote as well. I was a little too young to really understand what Oprah was trying to do when she was on TV all the time. I’d see my mom watching it and I would usually leave or want to change the channel. It’s only now as an adult that I realize what she has done and how much of an incredible person she is. Favorite post ever on hrg. I had to have a talk with my mom about how I do not want her talking negatively about her body or any other woman’s body, talking about diets, etc in front of my daughter. Our bodies are awesome for what they can do, especially as women/girls. This was a great post! I think most people needed to be reminded of this “paintbrush theory” every now and then. Some of my favorite running books are: Eat and Run by Scott Jurek, Run or Die by Kilian Jornet, and I found all of Dean Karnazes books to be pretty good. I like to listen to running audiobooks on my long runs to motivate myself to keep going. Tonight for dinner I had leftover African peanut stew, but tomorrow- Taco Salad! I love love love this post! Paintbrushes…what a great concept! I also love love love Oprah! I swear we are friends! How cute! I adore hole family! I love how you think about that photo that shows your “cottage cheese” (LOL) – let’s be honest, all women have it, so why pretend that there is a beauty standard of being cottage cheese free when it’s really not possible (even if you’re super-thin!). It’s part of who we are as women! P.S. What are your favorite running tanks? I always love the ones that you’re wearing in your photos – are they all the same brand? I read your blog every single day and always love and enjoy it. I don’t comment often, but I had to tell you that I stinking LOVE you even more now! Thank you, thank you for sharing all of the versions of your paintbrush. 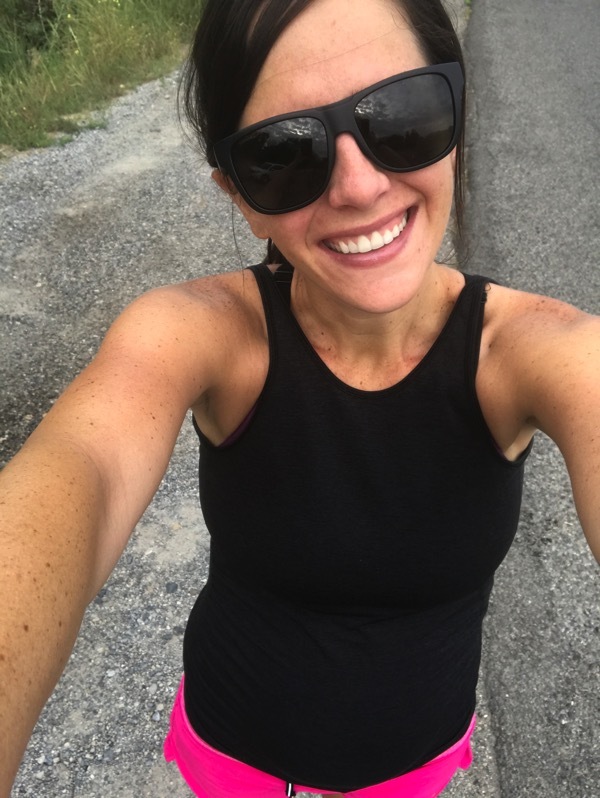 I think too often, especially as women (and runners), we see the social media versions of people we admire and emulate and feel like we can never be quite as fast/put-together/cute/funny/etc as those we see. Thank you for reminding us that we are all beautiful humans in every work of art we paint. Virtual hugs. love this post…lots of variety! let me first say, i literally get nut butter on everything-clothes, bags, books/magazines, my computer/phone…its always on my fingers! and i think i lick it all off but apparently not ;) oh well, true love for the stuff. Great post, my first time here and been reading 3 great posts so far, loving it!! Girl, I seriously didn’t even notice the cottage cheese ’cause I was too busy admiring your toned arms!! I guess it’s human nature to focus on the imperfections versus the strengths of our bodies, but I love your paintbrush analogy.